Now that Spring has arrived, it's time for people to get outside more. This is the time of year that you start to see bicyclists dashing in and out of the streets. Be aware that bicyclists have a right-of-way in almost all circumstances, regardless if it's an inconvenience. 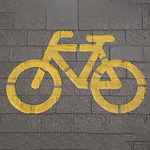 Often times, a bicyclist will become distracted or simply make a wrong move in the path of your vehicle. Still, by providing them with the courtesy and benefit of the doubt, you're not only being gracious, but you might also save their life! By being non-reactive to the inconvenience, but rather compassionate and abiding by the laws, you're making a difference on the roadway. Instead of becoming annoyed by a bicyclists' getting in your way, wave "hello" and give them the right-of-way. Don't forget to stop by Sale Kia for a test drive, so that you can wave hello in your new car!